Gustave Courbet’s Fox in the Snow depicts the animal mauling its prey, the rodent’s blood spilling onto the blanket of snow. The brutality of this image is intensified by the brilliance and directness of Courbet’s brush stroke. Here he uses brush and palette knife to differentiate between the crisp, white terrain landscape and the fox’s soft, red fur. This painting is a quintessential example of Courbet’s realism: he refused to depict traditional subjects of mythology or history and was instead intensely fascinated with subjects of everyday life. The crouching fox at the center of a snowy landscape commands our attention, and it is only at second glance that we notice his prey, a dormouse in the process of being dismembered by the fox’s rapacious jaws. Courbet himself was an avid hunter, and the accuracy of the scene likely derives from his own experiences in the rugged countryside of his native village of Ornans in the east of France. The vivid and unsentimental treatment of violence is typical of Courbet’s animal paintings and hunting scenes, and the fox, both as predator and prey, would become a recurrent motif in the 1860s. During these years, Courbet produced many landscapes, and snow scenes were his specialty. Courbet exhibited his first hunting scene, which earned both critical and popular praise at the Paris Salon of 1857. _Fox in the Snow _was first shown in Besançon, near Courbet’s hometown, and critics felt that the local audience had a special appreciation for the fidelity with which Courbet captured the landscapes of the region. The painting continued to receive positive acclaim when shown at the French Salon of 1861. Heather MacDonald, DMA Label copy, November 2008. 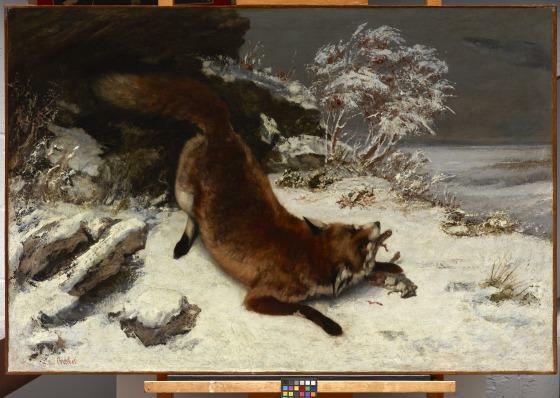 Dorothy Kosinski, "Gustave Courbet's 'Fox in the Snow'," in Dallas Museum of Art: A Guide to the Collection , ed. Charles Venable (New Haven, NJ: Yale University Press, 1997), 102. Bonnie Pitman, ed., Dallas Museum of Art: A Guide to the Collection (New Haven, CT: Yale University Press, 2012), 190. When Fox in the Snow appeared in the Salon of 1861, it was selected by the state-run lottery commission for their annual benefit lottery sale; Khalil Bey, former Turkish Ambassador to the Court of the Czar, added it to his important collection of contemporary masters. 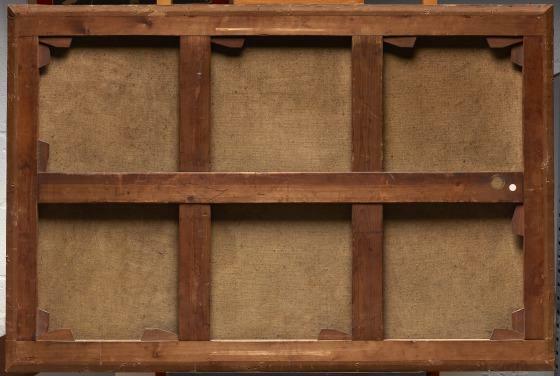 He later declared bankruptcy and sold his collection at auction in 1868. 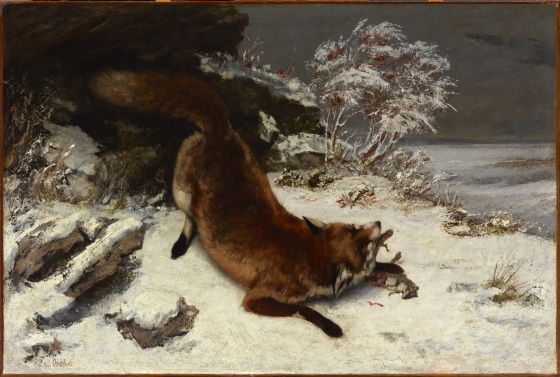 Recountering the Collection: Gustave Courbet's Fox in the Snow at the Dallas Museum of Art~ Read Peter Simek's article for D Magazine, June 9, 2011.